After several liberal activists including a professor of Fatima Jinnah University mysteriously disappeared, state security agencies once again found themselves facing negative international attention. Critical statements from international human rights NGOs and foreign governments began pouring in. Then came the ultimate trump card. The ‘Ace of Spades’. Blasphemy allegations. The allegations began from right-wing hyper-nationalist websites and social media accounts like so-called ‘Pakistan Defence’. There is no proof that any of these missing are responsible for any blasphemy. 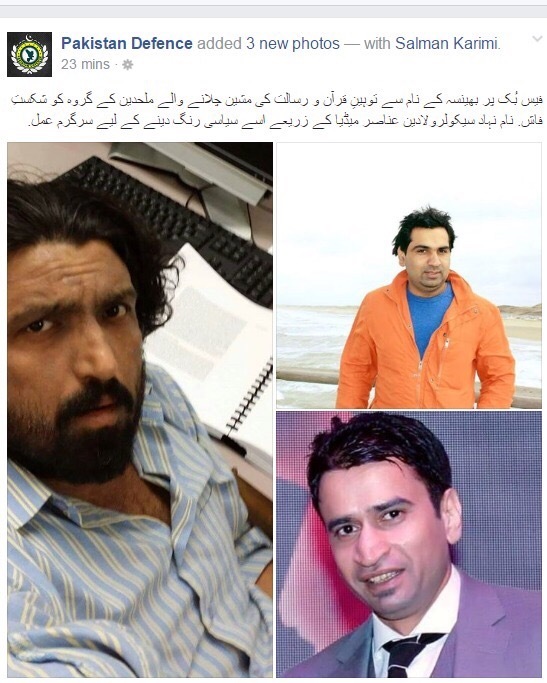 There is not even any proof that any of these activists is behind the ‘Bhensa’ account that is being accused! Actually, they were originally accused of being anti-Army, not anti-Islam. Now that the blasphemy accusation has been made, though, it has also been formalised under the law as application has been submitted to register blasphemy cases against the missing activists. However, this could be a test case not only for the democracy but for blasphemy law as well. Civil Rights activist Jibran Nasir is calling for arrest of Pakistan Defence admins for inciting violence against the activists. At first it sounds like fantasy, but on second thought there may be something to his thinking. No less than Chairman Pakistan Ulema Council Tahir Ashrafi has called for extreme care in handling of blasphemy cases and has even called for death penalty for those leveling false allegations. I personally do not support death penalty, but Maulana Ashrafi’s view shows how serious the issue is. Therefore, everyone can agree that such cases should be decided in court based on all the evidences. In order for a court to evaluate, both the accused and the accusers should be made to appear before the Court to be questioned. The disappeared activists must be produced and also the admins of Pakistan Defence and other social media accounts that are making such serious allegations should be produced before the Court also. Otherwise, isn’t it those leveling such allegations from behind anonymous accounts who are making a mockery of the Court as well as the blasphemy law? Perhaps there is someone who has committed blasphemy. We cannot know unless the case is heard by an impartial Court. There is also the question whether someone has tried to misuse blasphemy allegations in order to distract attention and cover their tracks. This also cannot be known unless all the actors and evidences are examined by the Court. Pragmatic Moderation: An alternative to failed hyper-nationalism? Prime Minister Nawaz Sharif should be commended for attempting to use diplomacy to highlight the plight of Kashmiri people. However, it is time to face the fact that the hypernationalist narrative that our officials have been promoting has completely failed. This does not mean that the Kashmiri cause is failed, it just means that the way we have been trying to help has actually being hurting. If we truly want to help the Kashmiri people, we need to try something different. First let us discuss why our current efforts have failed. It is easy to blame the Indian lobby for all of our failures, but we should be honest enough to look in the mirror. Here is one that Jibran Nasir has held up for us. During the recent diplomatic mission to Washington, Senator Mushahid Hussain found himself facing the usual questions about how Pakistan can be taken seriously on Kashmir when our diplomats are singing the praises of Hizbul Mujahideen commanders at the United Nations. Senator Hussain gave the correct answer, which is that ‘one man’s terrorist is another man’s freedom fighter’. As much as that may make sense to us, though, we need to think about what the rest of the world is hearing which is that ‘your terrorists are our freedom fighters’. We are not convincing anyone that Hizbul Mujahideen are not terrorists. All we are doing is confirming India’s claim that Pakistan is the ‘mothership of terrorism‘. We can blame whoever we want, but it cannot be denied that our efforts have achieved nothing till date but maintaining the status quo. We can compare Kashmir to Palestine, but in the words of one Pakistani scholar, “In case of Jammu & Kashmir there is not even that level of international support and interest that exists in the Palestinian question.” That scholar is none other than Husain Haqqani, and hate him however much you want, but you cannot deny that he is correct on this point. That quote was taken from an interview Haqqani gave a few months ago in which he makes several very good points about the Kashmir crisis and how the war between right wing ideologies in both India and Pakistan make this crisis and all other regional crises worse. Haqqani says that he considers himself a ‘pragmatic moderate’ and notes that ‘solving disputes first and then becoming friends is always more difficult than becoming friends first and then solving disputes’. However we continue to demand that relations can only improve once all disputes are solved. We are putting the cart before the horse. Despite the failure of our strategy till date, we still have so-called ‘experts’ saying that the way forward is just doing more of the same. As we debate and discuss about enemy narratives and diplomatic offensives, something Haqqani said about his own pragmatic moderation: ‘This is not about winning the argument, this is about winning the peace’. We should ask ourselves whether we are more interested in winning the argument. 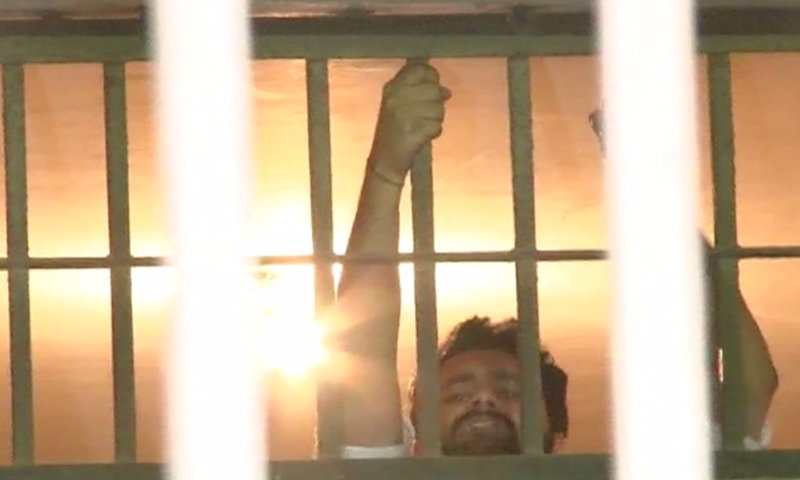 Jibran Nasir’s Arrest: Worse Than Originally Thought? We can argue about whether what happened to Jibran Nasir and fellow peace activists on Thursday was ‘arrest’ or ‘detention’, but this will be arguing over semantics and entirely missing the point of the incident. Similarly, many immediately took to terming the action as evidence of government siding with militants – an understandable response at first glance. But taking a moment to consider the larger context, the actual meaning may be way worse.